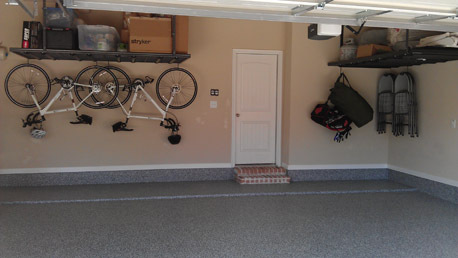 After recently surpassing over a Half Million (500,000) square feet of installed Garage Epoxy floors in Texas we can say for certain we know a thing or two when it comes to the proper way to install Epoxy Flooring for the garage. Our recipe is simple. 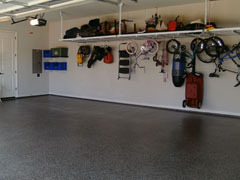 We Properly prep your garage floor to accept High Quality Epoxy material. 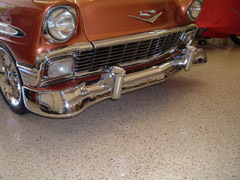 We broadcast our flake to 100% to give your floor that Amazing look. 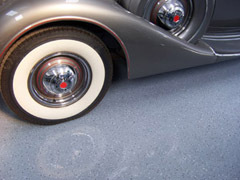 We then top it off with a High-Solid Polysaspartic to give your floor a Super Protectect and a Magnificant shine. We start off prepping your floor with a light grind of the surface to open up the concrete pores and remove any residual build up of oils and other solvents. Next we apply our Advanced Base coat Epoxy which is specifically designed for durability and longevity. We offer a low-VOC product that penetrates deep into the concrete providing Hot Tire and Chemical Resistance. We immediately broadcast the Color Flake of your choice to a point of rejection or what we call a 100% broadcast. 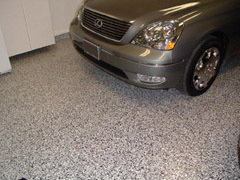 Every inch of the floor is covered creating a Vibrant blended color and hiding most imperfections. Once the Epoxy hardens we do a light scrape of the flakes. We then finish it off with a High-Solid Polyaspartic giving the floor a High-Gloss finish that is extremely abrasion-resistant. 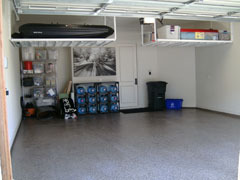 All of this can be done in a days time and you can have your cars back in the garage in just a few short days. We offer a limited lifetime guarantee on all floors and we promise that if you are not satisfied we will make it right. So what are you waiting for? Call today so we can come out and see if your floor is a candidate for a Stunning new Epoxy floor. And remember not only have we installed over 500,000 square feet and climbing, we also have been in business over 15 years. So when we say lifetime guarantee you know we will always answer the phone.